Some things in Jordan seem unchanged since my last visit which, scarily, was over 25 years ago. People are as friendly as ever to strangers; “Welcome to Jordan” is still a very common greeting and, though people are keen to sell us tourist goods when we venture into shops, the atmosphere is friendly and unpressured. Another constant theme is the desire to feed us well – which is even more obvious this time whilst we are among Jordanian friends! One thing that does differ is that we are not invited into strangers’ homes for mint tea in the way we were last time. That might have been partly because we were travelling differently – even Pat probably isn’t up standing by roadsides in the heat and hitching rides in lorries, though she coped fine with the vagaries of the bus system! A bonus is that, when we were offered tea this time, we were asked whether we wanted sugar in it, rather than this being the default. Again, maybe this was because we were around friends much of the time. 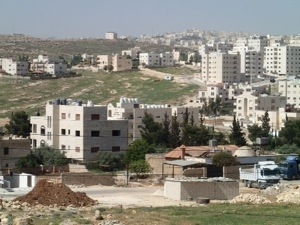 One really obvious difference is the amount of new construction going on everywhere, especially around Amman. This was difficult to quantify, as we stayed centrally last time rather than in the suburbs, but I’d be really interested to look at some old aerial photos. The houses around Hanan are all new and the view from her balcony will soon be reduced by the new buildings appearing constantly. Another, less happy change, was the presence of UNHCR tents alongside traditional Bedouin ones, particularly around urban areas. Some of these were surrounded by mountains of rubbish and it looks like people are really struggling to eke out an existance. Several people talked to us about the number of Syrian refugees currently being hosted by Jordan though, perhaps surprisingly, most saw this as an obligation they needed to meet rather than something to complain of. The population of Jordan is something like 50 % Palestinian in origin and Jordan has become home to many Iraqis too since the Gulf Wars, so I guess it is not a new situation to them. The other thing that was very noticeable to us was the air pollution in the towns and cities – in both Madaba and Amman the air is thick with car exhaust fumes. The narrow, older streets certainly weren’t designed for the volume of traffic they now carry and there hasn’t yet been time for a good public transport system to develop to get to the rapidly-growing suburbs. Unsurprisingly, several Jordanian friends had anecdotes of children suffering from asthma and other breathing difficulties. All that said, our overriding impression was of the warm reception we received everywhere and the friendliness, tolerance and openness of people we met – old friends and new. A fantastic experience. Where next is the only question; Algeria, Iran, Malaysia….. Some of the collection of unlabelled cooking ingredients pressed on us which I’m glad we didn’t have to explain to anyone at customs! 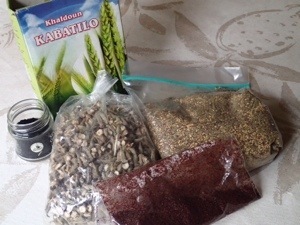 Freekeh, dried okra, Sumac, Za’atr and Nigella seeds. Using these will bring back many happy memories.